I’m not even a student of literature, or even much of a reader at all for that matter, but I’ve noticed that there are artistic differences between the folk tales of the British and the Europeans, and with those of The Arabian Nights. What are they, you ask? Well, read the book and find out. It’s there, as curved and flowing as the arabic alphabet it was originally written in. 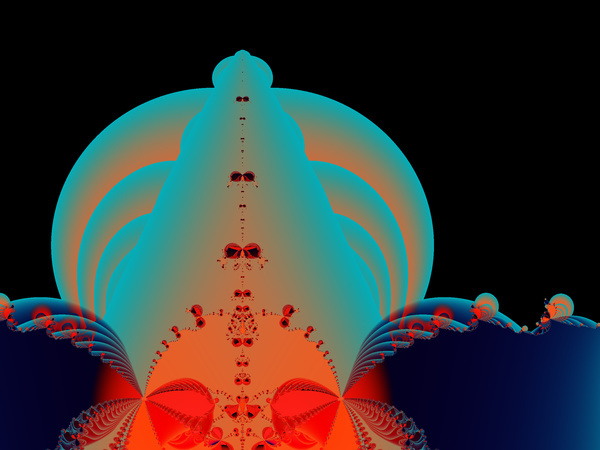 Just as The Arabian Nights can be mistranslated or European-ized, fractals can be layered and “artist-ized”. For example: one translation of The Arabian Nights I read told how Sindbad returned to Baghdad after another voyage into the uncharted world and out of thanks for surviving, gave a large donation to a “church”. Obviously it was a mosque, but why use a word which in 20th century English usage is never used to refer to a mosque? (And this was a version from the 1940’s.) Why not change Sindbad’s name to Sigfried or Samuel or Stephen, as well? Or substitute Basra with Vienna (not a good substitute for a busy ocean port) or Paris or London instead? Anyhow, translation isn’t always so simple and sometimes there is more than one reasonable rendering and the final choice can come down to subjective, stylistic preferences that grow out of long, complicated scholarly arguments — the sort of things which I suspect bored Sindbad in Baghdad and drove him back out to sea… In fact, the Sindbad stories, although also of Middle Eastern origin, are not considered part of the Arabian Nights and were included by European publishers who regarded all Middle Eastern folktales as a single category, in the same way as “fractal” art includes, from time to time, imagery that isn’t strictly “fractal”, but looks like it. I’m not arguing for a “pure” fractal genre, or even that such a category (is such a category even possible?) should have a special status; many of the stories in the “Arabian” Nights are very similar to those of Indian and Jewish origin. So in the literary arts as well as the visual arts, categories are a matter of degree because styles and methods are easily, even subconsciously, influenced and exchanged across (apparent) cultural boundaries. In such a context, purity has to be defined because very little is or can be isolated. What I would say is: Don’t overlook the “natural” beauty of a simple fractal formula rendered in a fairly plain way in a program like Sterlingware. There is no natural or “pure” way to graphically render fractals, but it is possible to use simpler methods which allow the fractal algorithm to contribute more of the imagery instead of less. Like a translation that doesn’t attempt to embellish or transpose the cultural context of The Arabian Nights, sometimes fractal art can be more interesting by allowing it to retain its original “style” and making less adjustments to it.